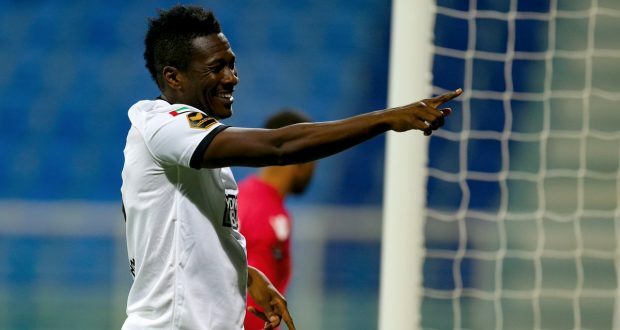 Ghana international AsamoahGyan has equalled the record of former Manchester United striker Robin van Persie and that of former Man City striker Edwin Dzeko. Both top strikers have scored 50 goals in the international scene for their countries. When Ghana met Ethiopia at the 2019 African Cup of Nations (AFCON) qualifier on Sunday, Gyan was the skipper. He connected to a cross from Thomas Agyapong to score the goal. The goal sends him to the 35th spot as with the Dutchman and Bosnia & Herzegovina star on the international goalscorers scene. He becomes the all-time top goalscorer for his country as well after missing all chances in his last two games for the Black Stars. Iran’s Ali Daei, Hungary’s FerencPuskas, Japan’s KunishigeKamamotoare the top three on the list with 109, 84 and 80 goals respectively. The popular Pele of Brazil is sixth on the list with 77 goals. Cristiano Ronaldo has 73 goals which place him in the top eight international goalscorers. The World Cup goals specialist MiroslavKlose is tied in in the ninth spot alongside Saudi Arabia’s Majed Abdullah and Thailand’s KiatisukSenamuang at 71 goals apiece. Robbie Keane of Rep of Ireland is 13th with 68 international goals. He shares the spot with Guatemala’s Carlos Ruiz and Egypt football legend Hossam Hassan. Didier Drogba follows closely in 16th spot with 65 goals. Zlatan Ibrahimovic, David Villa, Lionel Messi, Landon Donovan and Samuel Eto’O also rank in the top 25. HakanSukur of Turkey, France’s Thierry Henry and Vietnam star Le Cong Vinh are above RVP, Dzeko and Gyan as they scored 51 goals. Gyan still has little time to score more and rank higher.